Santa-Marie “The Surgeon” Venter returns to the hexagon to welcome Natalie Ausmeier on her debut after a long period away working on her skill set. 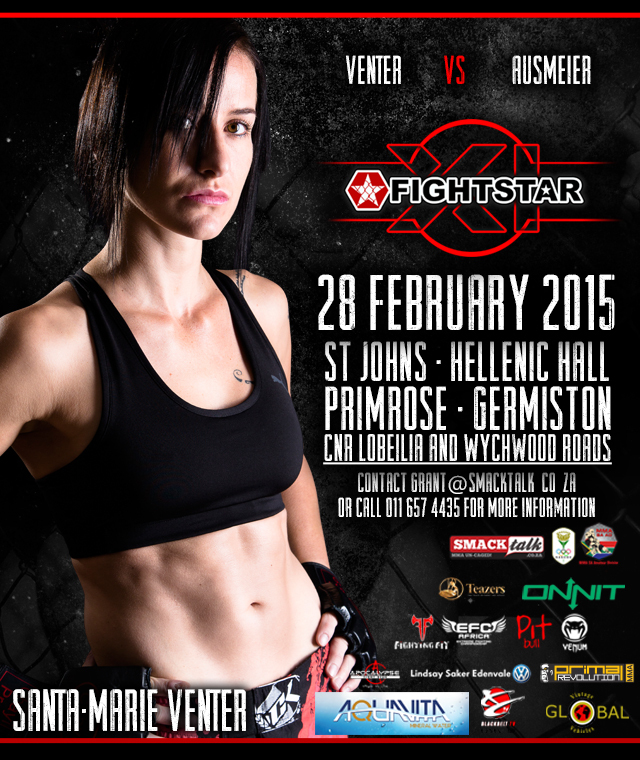 Venter has already proven herself in the Fightstar cage before and looks to gain the win at Fightstar 11 on the 28th of February 2015 in Johannesburg, South Africa. We caught up with Venter to find out how her camp is going and where her mind is at the moment. For those that don’t know you yet, can you tell us more about yourself? I’m Santa-Marié Venter, 32. Martial Arts has been an integral part of my life since I was 3 years old, and MMA was just a continuation of this journey. MMA seemed like the evolution of the arts with the times, and 3 years ago I joined a gym. There is a very ironic part to this story… I DJd from 2001-2010 and spent a lot of time at the Technics DJ Mix Club in Blairgowrie. My good friend Dave Agsteribbe, co-owner of the school, used to come to the shop talking about his great MMA training. Back then (2001) I had to ask him ‘what’s MMA?’- it had only just been started in SA. And who was Dave training with, one block from the DJ school? Rodney King. After 13 years, my real MMA journey started in April 2013. My coach and mentor? None other than Rodney King. I’m proud to be a part of Crazy Monkey Defense and to be training under the founder and master himself. We have gyms all over the world and this suits those with travel addictions perfectly (wink-wink)! With EFC opening up the womans divison in the pro leagues, are you going to be working toward that? Being a full time doctor must make it tough though to follow this sort of dream, can you tell us what your schedule is like when it comes to a fight camp? My schedule has become a lot less hectic since I quit orthopaedic surgery in June 2013. The decision was partly made to create a more flexible lifestyle for myself, as I was working 3 weekends a month and could never take leave for longer than 5 days. Now, I plan my own week and take off whenever I want to. Thursdays are my off days at work and they have been set aside for training. In camp, I drive through to my coach in Blairgowrie 4-5 days a week for training. I have two amazing sparring partners with completely different skill sets to prepare me for facing anything. Apart from that, I will do drills with friends or some bag work whenever I have the chance. I was lucky enough to go to Tiger Muay Thai for 2 weeks of pre-camp training, and that prepared me well for my official camp with my coach. Have you ever seen your opponent fight before? I’ve never seen her fight. Is there a specific game plan you’re working with or are you going in with an open mind on the night? Do you have anything you’d like to say to Natalie? Congratulations on making your MMA debut, it’s a big step! Let’s go out on the 28th and have some fun. Give us your thoughts on Danella Eliasov and what do you think we can expect in the first WMMA bout in EFC history? I’ve only seen Danella fight once before, so I can’t really comment. Her opponent I don’t know either. All I can say is good luck! Anything you’d like to say to your friends, family, team and sponsors? My mom and gran have been amazingly supportive (although they have often questioned my sanity!) Paul, my brother, and his wife have also been there for me all the time. My family is the most important thing in my life. It is an absolute honour to train at Crazy Monkey Defense with Rodney King- not only is he a mental game, ground, stand-up coach and PhD student- he is also a great person and friend. My 2 training partners are the most awesome guys you’ll ever meet- thank you Shuaimeng Liu and Dwain Kotze for helping and challenging me with every session! To my friends who are always willing to help with drills, sparring and a social session when needed- Dricus, Niel, Leandre, Gianluca, Steph, Marino, Edrich, Wessel, Carl and numerous others- thanks for everything, I love you guys. Fightstar is proudly brought to you by Smacktalk.co.za, Fighting Fit Africa, Pitbull Energy Drinks, Onnit, Primal Revolution, Vintage Global, Venum Fight Wear, Apocalypse Fight Gear, Teazers, Lindsay Saker Edenvale, Blackbelt TV, Aquavita Mineral Water and EFC Worldwide.